Apple may try hard and harder every day to keep Samsung out of US but we are sure that they will fail successfully on that. Samsung is just getting stronger every day in US. Today AT&T announced four Android devices on their lineup, all from the Koreans. The bunch consists of three LTE smartphones and one tablet, which also packs the aforementioned network connectivity. AT&T announced its own version of the Samsung Galaxy Note II. Its specs are no different than the ones found in the international version, except the presence of LTE and AT&T's logo on the back. 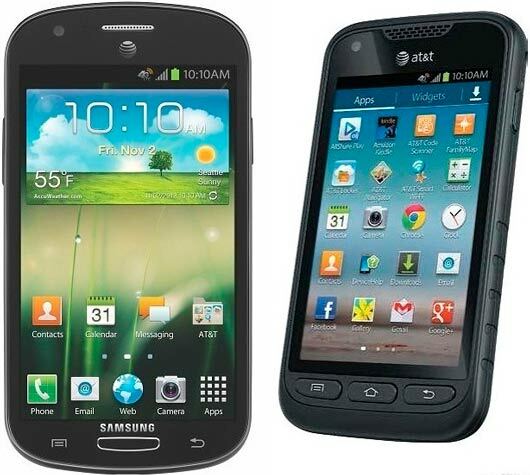 Samsung Galaxy Express is one of two phones AT&T announced today. The Android 4.0 ICS smartphone packs a dual-core CPU clocked at 1.5GHz and a 4.5" Super AMOLED Plus display. A 5MP snapper and 2000mAh battery complete the list of known specs. If you want something tough then Galaxy Rugby Pro is for you. The successor of the Samsung Rugby Smart packs LTE and Android 4.0 ICS, tucked into a rugged body, which is built up to 810g military specifications. A 4" WVGA Super AMOLED display, a 5MP camera, as well as enhanced push-to-talk are also part of the spec sheet. Finally, AT&T announced the addition of the 4G LTE flavored Samsung Galaxy Tab 2 10.1 to its lineup of tablets. Pricing and exact availability for the devices is yet to be known.